Oh, the luxury! The Blumarine Fall 2014 collection is filled with some of the most gorgeous fabrics we’ve seen this season. Titled ‘Unexpected Heritage,’ this set was shown during MFW…a definite standout for sure. Designer Anna Molinari has presented an assortment filled with rich kimono colors and styles mixed deliciously with luxe fuzzy boldness. There’s leather, satin and mesh all wrapped up in one lovely bow. Model Sasha Luss walked this show, transcending us into absolute grandeur. This wouldn’t be a fall set without the dazzling jewel tone shades. Purple, teal and rich onyx stand out like gems from a jewelry box. 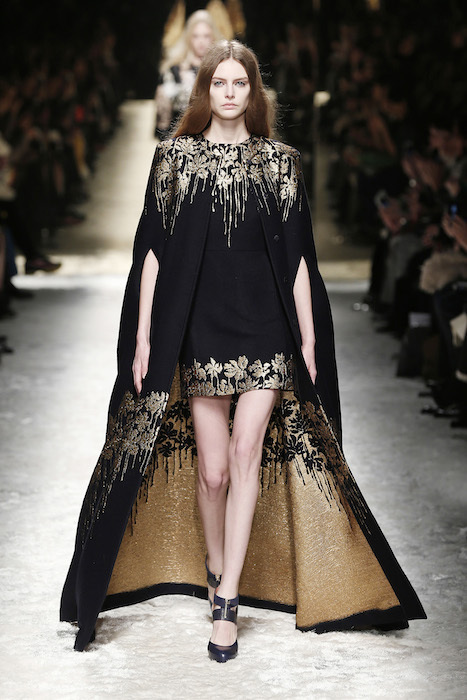 Long open coats and one fantastic cape feel regal and otherworldly. The identical dress comes in several variations, each its own special standout. Skin’s showing but in classy ways, there’s never any harm in showing a bit. Loving a deep purple leather number…at first glance it looks like a jumpsuit, but they’re separates for mixing functionality. Perfect. A long white coat grazes the floor delicately. It looks superb with the kimono sleeves. Another is a perfect shift coat for fall and winter inbetween. This designer’s taking it a step further. The bar’s been raised! fdmLOVES BLUMARINE Fall 2014 selects by Brigitte Segura, written by Allison Ripa. (Photos by courtesy) + more to come!